Nothing - everything is covered! Taking less than 10 minutes to reach its highest temperature of 500°C, the Burnhard Nero is definitely one of the fastest models we have reviewed. 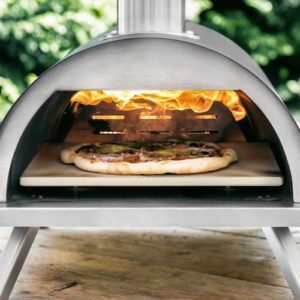 The cordierite pizza stone it comes with can retain heat well, baking pizza bases in under five minutes and ensuring they are crisped to perfection. The actual body is made from two separate layers of stainless steel outer, and there is a layer of wool in between. This makes the heat control energy efficient and keeps it hotter for longer. A built-in thermometer is on the removable door, so you can easily monitor the internal temperature. To avoid losing a lot of heat if you need to top up the fuel, simply use the dedicated refill opening. The handy pizza lifter included makes taking the finished product out of the oven easy, with no risk of burns or dropping the food thanks to the long wooden handle. It is easy to move about due to the compact design and foldable feet. This also makes it easy to store away when not in use, to prevent it from becoming damaged by the elements. Talking of elements, the chimney has a rain cover on the top, so if the weather takes a turn while you are cooking, you don’t have to rush to get the food out. 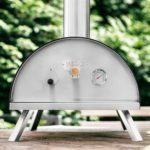 You can also choose which fuel to use, as it is compatible with firewood, pellets, lump charcoal or briquettes. It is best to experiment and find the right one for you. To keep it clean, just allow it to cool and wash all the removable parts by hand. You aren’t just limited to baking pizzas either. From quiche to bread to classic ‘al Forno’ dishes, if you don’t fancy pizzas, it doesn’t mean the oven is out of use.